I have a Fuji Sportif with a 9 speed 11-32 cassette. I'd like to upgrade the cassette for hills. It has Sora components. Is an 11-36 possible without upgrading the rear derauiler? Would a mtb cassette fit or would it have to be a road cassette? In short, maybe. A good way to check and get an idea is to see how much space you have between the top of the RD cage and the 32 gear. If there is adequate clearance, it may work but will likely need a new chain that is a bit longer. If there isn't clearance, something like a Wolf Tooth RoadLink could work for you. Another option is to swap out the RD for a long cage version. I changed out my Shimano 105 with a Deore XT so I could get an 11-36 cassette on my bike. Works great! Would the wolftooth roadlink extend the clearance to run bigger cassettes? I've never seen those before but looks like a good upgrade.. It can do the job within limits. The issue ultimately comes down to how much chain slack the RD can take up. If it's not enough, you get a slack chain and all the not-so-nice things that can lead to. Generally, if you have a short cage RD, you may not have enough take-up to make an 11-36 work. It seems that most medium cage RDs can do more than the manufacturer claims. In my case, I had a short cage RD with a 12-28 cassette and it didn't look like a Roadlink would do what I wanted, which was to run an 11-36. So I went with the Deore XT RD. In my case, the 105 was 10-speed and I discovered that the Deore 9-speed was the way to go. The only other change I needed to make was a longer B-screw. The stock one was not long enough to adjust to the needed clearance. How would I go about seeing if it is a short cage RD? Upon looking at my bike, it is a Tiagra RD-4601 with MA stamped on top of it. Looking on Shimanos website, there is no 9 speed version of this RD and only a 10 speed. Am I missing something here? The Speeds is not the Derailleur's job it moves inward at the increments that are on the shift lever..
at the other end of the cable..
a 24 t granny gear on the triple crankset. It's not uncommon for the RD to be 1 "step" above the FD/shifters, quality wise. Last edited by Bill Kapaun; 04-29-18 at 05:31 PM. I looked at my bike and called Shimano and it looks like the RD is a medium cage. Looking on Shimanos site, it looks like the max is a 40T. Would I still need the Wolftooth Roadlink? Tiagra 4600-series components are 10-speed, but they use the same cable pull ratio as Shimano's 9-speed components and are thus interchangeable for the most part. According to the specs on Shimano's web site HERE, the Tiagra RD-4600-GS (GS = medium cage) derailleur is rated for a maximum cog size of 30 teeth. Its maximum wrap capacity is 40 teeth, but that's a different limitation. Shimano's generally pretty conservative with their ratings, so it wouldn't be surprising that a derailleur rated for a 30 tooth cog could handle 32 teeth. 36 would be pushing it, though. So if you've got a compact double crankset (34/50) and an 11-36 cassette, you'd need a derailleur with a wrap capacity of at least 41. A medium cage Tiagra RD-4601 has a published wrap capacity of 40. It'll probably be OK, but you're right at the edge of the published spec. If you size the chain properly for the big/big gear combo, you'll probably find the chain to be fairly slack in the small/small combo. 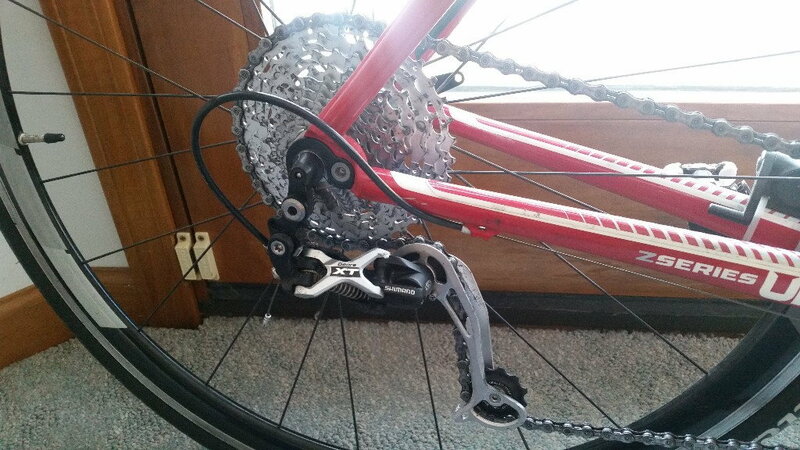 If you want to go to an 11-36 cassette and your Tiagra derailleur doesn't work as-is, my preference would be to pick up a mountain bike derailleur like the Shimano Deore M591 instead of using a Wolf Tooth Road Link. It's about $15 more expensive, but it'll handle your desired cassette size and wrap, without an adapter. I did the math and came up a wrap of 37.. It seems like an 11-36 might be the limit without having to upgrade the RD..
We can't check your math because you've never stated what size rings you have. So your rings have a 12T difference? Crankset is 50-34=16. Cassette is 32-11=21. 16+21=37 for wrap. I had a Tiagra 4601 RD and it worked fine on 50/34 with a Shimano SLX HG81 10 speed 11-34 MTB cassette. I did not try a 11-36. I ended up swapping the Tiagra 4601 RD for a Deore M592 MTB RD because I bent my Tiagra. Put 4000 miles on that combination in the last year. I also have not tried an 11-36 with the M592 but I have no doubt that it would work fine. You can use a 9 speed MTB cassette in place of a 9 speed road cassette. Get the 9 speed 11-36 MTB cassette of your choice and try it with your Tiagra RD. If it is not up to the task with some B screw adjustments, the M591/592 RD is a great reliable option. The main functional difference between the 591 and 592 is the 591 has a build in adjustment barrel, the 592 does not and therefore requires either a frame or an in-line adjuster. Last edited by u235; 05-01-18 at 08:21 PM. You have the following options of 10-speed Shimano 11-36T cogsets. I've run the SLX job for four years, and it is still going strong. How would I go about figuring out what is the best cassette adapter tool to go with?